It would be hard to argue that Adam Lallana is Liverpool’s best player. That designation should probably go to Philippe Coutinho, who seems to have finally internalized the concept of shot quality, and if not him then Sadio Mané, the curiously underappreciated wide forward who dominates nearly every game. 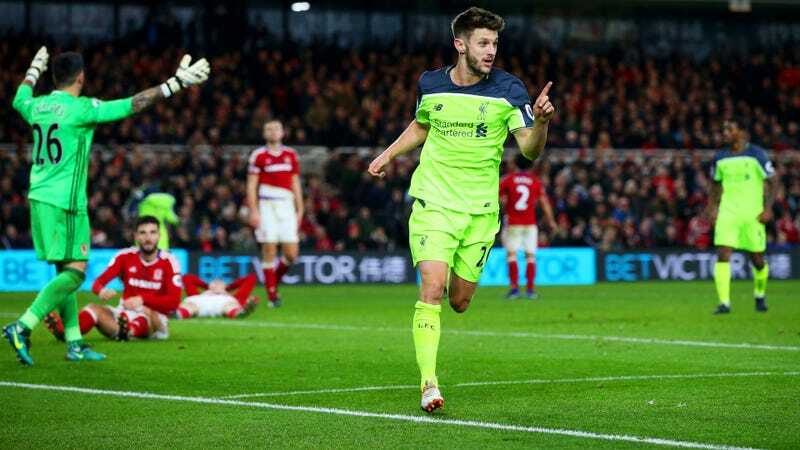 But if Liverpool have a singularly irreplaceable player, one whose particular set of skills grease the gears and align the sights and load the cannon for this new-look, ball-hogging, league-flattening tank of a team, it’s Lallana and his sweet feet and wonderful brain. To understand why Lallana is so important to Liverpool, you have to understand why and how Liverpool play the way they do. Manager Jürgen Klopp made his name as coach of Borussia Dortmund committing to a hard-charging, high-pressing, lightning-attacking “heavy metal” style of soccer. The ball was the enemy. When opposing teams had it, Dortmund were instructed to attack their rivals as quickly as possible to steal it back. When Dortmund had it, they were told to spank it forward immediately, a mass of bodies screaming after the ball that had been punted ahead in order to pick it up, push it further ahead to a teammate, and ultimately thwack it at the goal without delay. This was something like the antithesis of the patient, possession-oriented game of Pep Guardiola and Barcelona that was all the rage around that time. The only reason to have the ball was to get rid of it via a shot as soon as possible. This philosophy was wildly successful for Klopp in Germany and in the Champions League, and it’s what earned him the lofty reputation he has today. When Klopp came to England, everyone thought he’d bring this same fast and furious style of play to the already wide-open Premier League. The thing is, though, Klopp’s Liverpool team currently resembles something more like Guardiola’s Barcelona than Klopp’s old Dortmund sides, and it’s Lallana who makes it work. Whether you call it athleticism or intensity or tactical naiveté, the Premier League truly is more all-action than Europe’s other big leagues. Everyone runs around really fast all the time. EPL soccer is notable for its speed and directness of play, where the archetypal player is more big and brawny than small and technical, more Frank Lampard than Andrés Iniesta. This isn’t a value judgement (both Lampard and Iniesta are all-time greats); it’s simply a statement of fact. Moreover, it relates to why Klopp has Liverpool playing more Barça-like than BVB-like. Because Premier League players are generally very fit and athletically gifted, and because the prevailing tactical philosophy—especially at the lower levels of the league—is to sit back, soak up pressure, and attack at speed when the ball is turned over, Klopp’s Dortmund-style game was always going to be difficult to implement in England. In Germany, Klopp could instruct his players to press high and try to run over their opponents because their opponents played in a way that rewarded this tactic. High defensive lines and high pressing was and still is the prevailing strategy in Germany, so by pressing higher and faster and countering ferociously, Klopp’s teams could take the ball from their opponents in promising positions and initiate attacks against disorganized and unprepared defenses. This isn’t so much the case in England. Try to press a team like Burnley high and they’ll just boot the ball over your head and up to their strikers, who will usually be adept at wrangling the lofted ball and then starting their own quick attack in a favorable spot of the field. When a pressing team does win the ball back, they often find that there isn’t all that much open field for them to sprint into, seeing as their opponents had already kept a good number of men deep, ready and waiting to stymie the offense. Not only that, but in a league with so much high-intensity running from big and strong players, it’s very hard to expend this enormous amount of energy for 90 minutes week in and week out. None of this is to say that pressing doesn’t work in England, as Tottenham’s recent success under manager Mauricio Pochettino attests. Liverpool themselves still do press extremely intensely, and it works very well for them. But it is to say that the heavy metal style Klopp made famous in Dortmund involved a different calculus that doesn’t perfectly translate to the English game, and thus possession of the ball—keeping it as both an attacking and defensive strategy, working it forward deliberately and with patience to slice open deep and compact defenses with a scalpel rather than an axe, giving players a breather from running their legs off to recover the ball immediately after turnovers—is now, by necessity, much more important to Klopp. Because Liverpool have so much of the ball now—their 59 percent possession average is good for second in the league, just a couple ticks less than possession-ideologue Guardiola’s Man City—and face so many deep defenses, they need a needle like Lallana to poke through the tiny holes in defenses. Lallana is able to perform this role with his passing, shooting, movement, and situational intelligence, which tells him when to press an advantage and when to pass the ball backwards and try to restart play. And when he does choose to attack, he’s been lethal. His six league goals are good for second in the squad and his six assists lead the team and are good for the joint-second highest in the whole league. Breaking down deep defenses is a meticulous task that takes time and careful effort. On the Liverpool roster, only Coutinho can rival Lallana in technical quality and comprehensive understanding of the dynamics of an attack, and Coutinho is a little too impatient to wait for the right moment the way Lallana does. No one else, and especially no one else who plays Lallana’s position—he’s a natural No. 10 who has transitioned seamlessly into his new role as a central midfielder—can match the Englishman’s proficiency at peeling open the kinds of defenses they commonly find themselves up against. This is why Lallana is Liverpool’s most important player. And it’s because of his mastery of the necessary skills in this critical role that Lallana very well might lead Liverpool to the title.